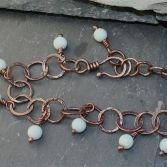 This pretty Amazonite Beaded Bracelet is made from solid Copper links each one handcrafted, textured and soldered together. 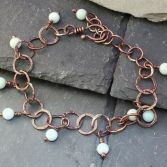 The links have a simple texture which catches the light and i have added a patina to highlight the textures. Each link measures 11mm in diameter, there's an extension chain so that the Bracelet can be worn any where between 17.5cm to 24cm so its perfect for a large or extra large wrist. 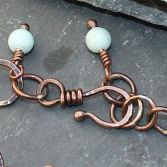 To fasten the bracelet theres a strong solid copper hook. The Semi precious Amazonite beads measure 6mm and are a beautiful opaque pale blue which looks stunning against the warm tones of the copper. 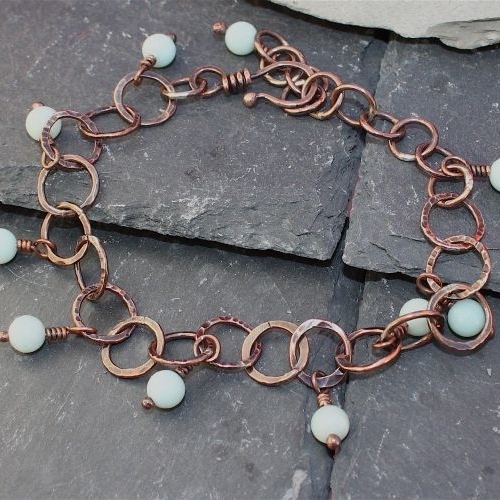 Your Amazonite Beaded Copper Bracelet will be presented in a gift bag, bubble wrapped and placed in a padded envelope and posted via Royal Mail special delivery (signed for) to any UK address free of charge.